This HD4 Large Plate Dolly is the perfect tree and landscape dolly for commercial use. It features four 16 inch tall, 4.8 inch wide tires, 24" wide 20" deep plate and has a True 2000 pound weight capacity but only weighs 115 pounds. The tires are 6 ply boat trailer tires and have a weight rating of 760 pounds each. That's 3,040 pounds of weight capacity on the tires. 1,000 pounds on this HD4 tree dolly is only 1/3 of its capacity on the tires and will not even look like anything is on it. 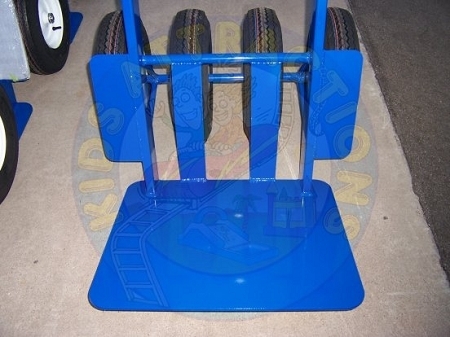 Our Large Plate heavy duty tree dollies are custom made for your application. The Large plate HD4 heavy duty dolly is virtually unbreakable and mainly used for items such as boulders, 36" and 48" box trees, crates, soil bags, bags of rock and sand and more. This dolly is perfect for heavy construction and off-road truck and tractor tires. Moving 600-1200 pounds has never been easier. One strong person can pull back and carry 700-800 pounds through grass, rocks, sand, and snow. And it fits through 36" doorways or gates! Our HD or heavy-duty dolly series have large steel frames with 1/4" thick steel lifting plates. Perfect for tackling the most demanding projects. Large enough to carry 1000 pounds and still fit thru a 36-inch residential gate or commercial doorway. Lower Lifting Plate: 20" x 24"